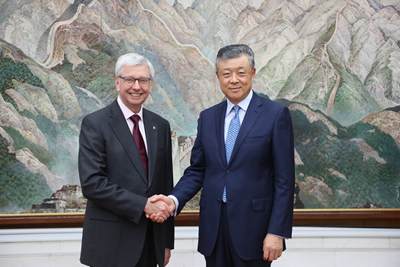 On November 22, 2017, Ambassador Liu Xiaoming met at the Embassy with Stephen Toope, the new Vice-Chancellor of the University of Cambridge, and exchanged views with him on the 19th National Congress of the Communist Party of China and the cooperation between the University and China. Ambassador Liu briefed his guest on the new ideas and measures adopted at the 19th Congress for promoting China's education, technology and international cooperation. He gave credit to Cambridge for its contribution to China-UK people-to-people exchanges, mutual understanding and friendship. Ambassador Liu noted that this year marks the 45th anniversary of China-UK ambassadorial relations, and it is also a year for consolidating the "Golden Era" of China-UK ties. The two countries have made remarkable achievements in exchanges and cooperation in various fields including education, science and technology. China is ready to work with Cambridge to further enhance the all-round cooperation between the universities of the two countries, and contribute more to the China-UK "Golden Era". 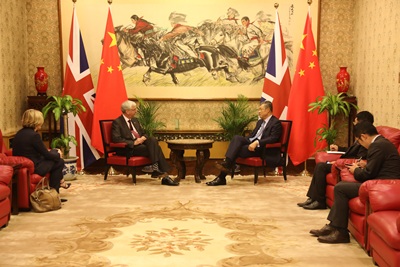 Stephen Toope said that it is one of the major strategies of the University of Cambridge to further expand exchanges and cooperation with China. He is willing to play a positive role in pushing the exchanges and cooperation between Cambridge and its Chinese partners to a new high so as to contribute to the "Golden Era" of China-UK ties.